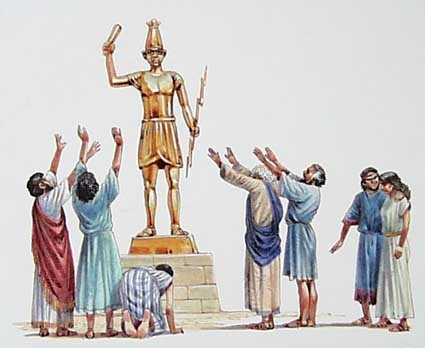 There may be some who could care less what an idol or graven image is,but for those who are a christian most assuredly want to know since God warns us to stay clear of such worship (Exodus 20:3-6). Websters dictionary defines an idol or graven image as follows:An object of extreme devotion,to admire intensely and sometimes often blindly one that is not a subject of worship,to devote oneself to something that is not God. Are there idols or graven images in our day and age?Scripture teaches that there are.In the old testament we learn of the chief god of the canaanites named Ba’-al,and the god of the philistines was dagon yet this is just a couple among many gods people sought to serve more than God Almighty who we know was in the garden of Eden and also who spoke face to face with Moses! In the new testament we learn there is a remnant according to the election of grace that God has reserved seven thousand men,who have not bowed the knee to the image of ba’-al (Romans 11:1-8) I say then, Hath God cast away his people? God forbid. For I also am an Israelite, of the seed of Abraham, of the tribe of Benjamin.2 God hath not cast away his people which he foreknew. Wot ye not what the scripture saith of Elias? how he maketh intercession to God against Israel saying,3 Lord, they have killed thy prophets, and digged down thine altars; and I am left alone, and they seek my life.4 But what saith the answer of God unto him? I have reserved to myself seven thousand men, who have not bowed the knee to the image of Baal.5 Even so then at this present time also there is a remnant according to the election of grace.6 And if by grace, then is it no more of works: otherwise grace is no more grace. But if it be of works, then it is no more grace: otherwise work is no more work.7 What then? Israel hath not obtained that which he seeketh for; but the election hath obtained it, and the rest were blinded.8 (According as it is written, God hath given them the spirit of slumber, eyes that they should not see, and ears that they should not hear;) unto this day. (1 Kings 19:18). God has always dwelt high above man as in the very beginning when Moses came to the mountain of God and the angel of the Lord appeared in a flame of fire out of the midst of a burning bush.In the last days the people of God will once again flow unto the house of the Lord that will then be established in the top of the mountains.God never changes but man does and has sought out many ways to serve Him,Yet He remains the same!For all people in that day will walk every one in the name of his god,and we will walk in the name of the Lord our God for ever and ever! (Micah 4:1-7). But in the last days it shall come to pass, that the mountain of the house of the Lord shall be established in the top of the mountains, and it shall be exalted above the hills; and people shall flow unto it.2 And many nations shall come, and say, Come, and let us go up to the mountain of the Lord, and to the house of the God of Jacob; and he will teach us of his ways, and we will walk in his paths: for the law shall go forth of Zion, and the word of the Lord from Jerusalem.3 And he shall judge among many people, and rebuke strong nations afar off; and they shall beat their swords into plowshares, and their spears into pruninghooks: nation shall not lift up a sword against nation, neither shall they learn war any more.4 But they shall sit every man under his vine and under his fig tree; and none shall make them afraid: for the mouth of the Lord of hosts hath spoken it.5 For all people will walk every one in the name of his god, and we will walk in the name of the Lord our God for ever and ever.6 In that day, saith the Lord, will I assemble her that halteth, and I will gather her that is driven out, and her that I have afflicted;7 And I will make her that halted a remnant, and her that was cast far off a strong nation: and the Lord shall reign over them in mount Zion from henceforth, even for ever.